Four more sleeps until we leave the scorching heat of Dubai and go on our 4-week holiday to Germany. The fridge has to be emptied. The vegetable shelf is pretty much my department, as I love to salads for my lunch. I decide what's for dinner and which veggies go on my kids' lunch or dinner plate. In other words, I am in charge of cleaning out that fridge thoroughly. In the one and only food magazine that I read (BBC Good Food (Middle East) a "Crunchy Detox Salad" caught my eye. It included raw red cabbage which I didn't have in my fridge, but all other ingredients. It was worth buying as this salad kept what it promised: vibrant colors, textures and flavors. According to the magazine, this salad keeps in the fridge for up to three days. I cannot comment on that as mine only lasted one, and I ate it all by myself. 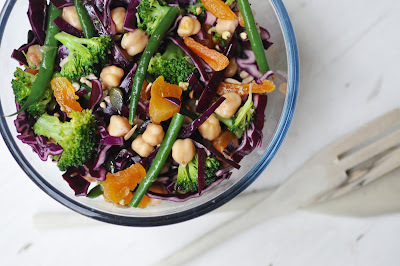 Beside the red cabbage, it contains just slightly steamed broccoli and green beans to maintain a crunch, chickpeas to add some substance and vegetarian protein. I recommend using home-cooked chickpeas as the canned once are normally a little too soft, especially if they are supposed to go into a crunchy salad. The dried apricots are, in fact, my favorite ingredient. They provide just enough natural sweetness that satisfies my sweet tooth enough to skip dessert. I love the ginger in the dressing as it adds some subtle spice to the salad. Steam broccoli and beans for 2 minutes. Transfer to a bowl with ice cold water to cool, then drain. In a large serving bowl, combine red cabbage chickpeas, green beans, broccoli, apricots and seeds. Combine all ingredients for the dressing and pour over the salad. Toss to combine. Ready to serve.